Entelodont Fossils with Facts and Photos. Entelodont was one of the most impressive mammals to have lived, in Florida, during the Miocene Period, about 18 Million Years ago. 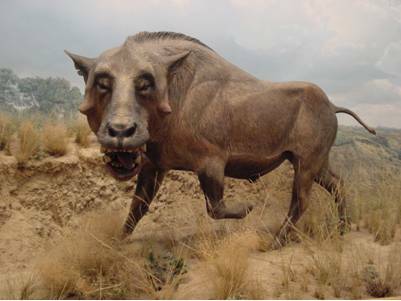 This prehistoric beast has been called by many names, such as the “Devil Pig” or “Terrible Pig” and was a huge pig-like animal or Artiodactyl (even-toed ungulate). 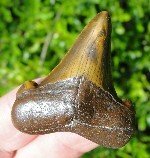 Entelodon meaning “Perfect Toothed”. Considered an omnivore, this prehistoric pig may have eaten almost anything it wanted, including scavenging of carcasses. It definitely was big enough to, over 10ft. (3M) in length, 6ft. (2M) at the shoulder and having a skull 4ft. long and almost 3ft. wide. This Extinct Giant Hog had bony protrusions on its lower jaws and head, with giant blunt and blocky incisors, canines and massive teeth, in general. This Bone-Crushing Scavenger had huge massive jaws with tremendous power. Its long legs suggest that it may have been a fast runner. In Florida, Daeodon species is the largest and the last of its group. Definitely, one of the top predators of its day.